Friday, March 6. 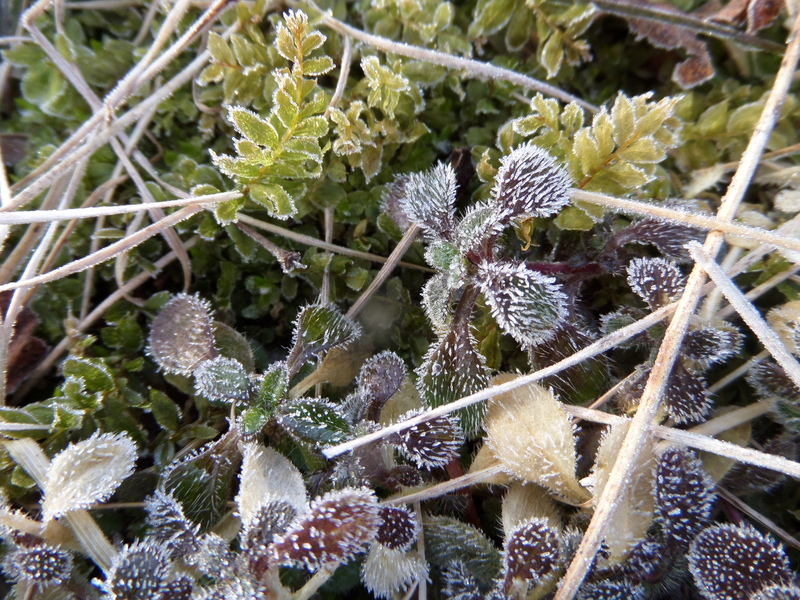 Winter and weeping are wearing me down, along with the monochrome light, and dirt-infused precipitation on everything. I used to say Chicago street snow looked like the bottom of an ashtray. After this long winter in upstate New York, innumerable cigarette pellets of gunmetal ice and ashy road salt line our avenues–and spirits. Even where the snow is still blank white, it has grown dull to my eyes. 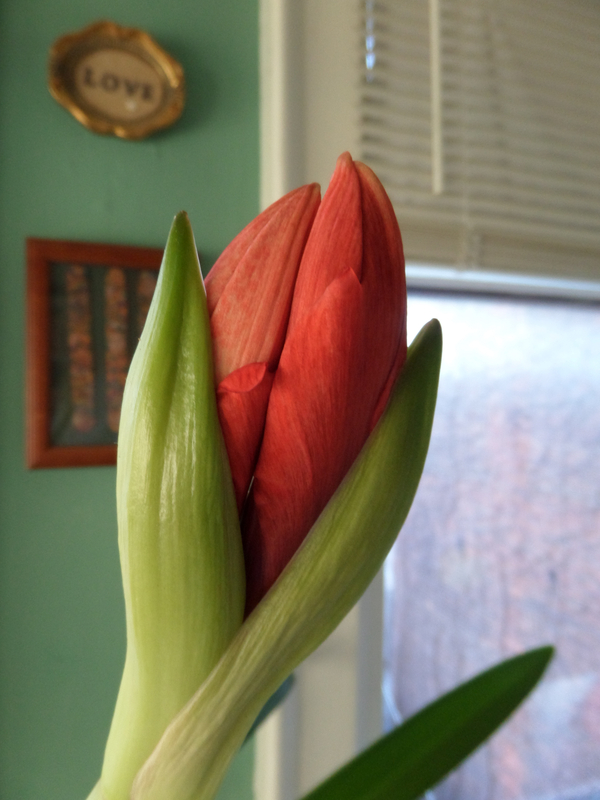 It’s been months since the amaryllis bloomed, and a week since my pale yellow butterfly faded away. 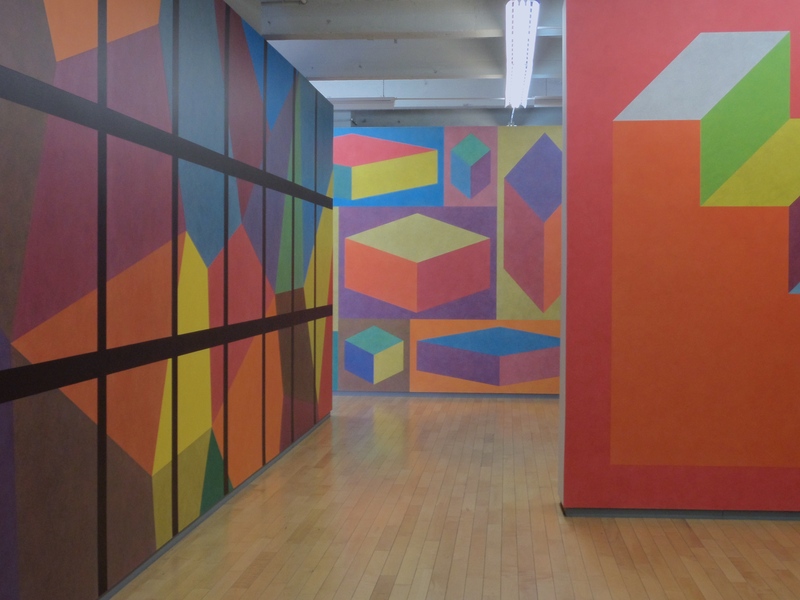 I travel in search of color, to the Massachusetts Museum of Contemporary Art (Mass MOCA). Once again I am surprised by serendipity. 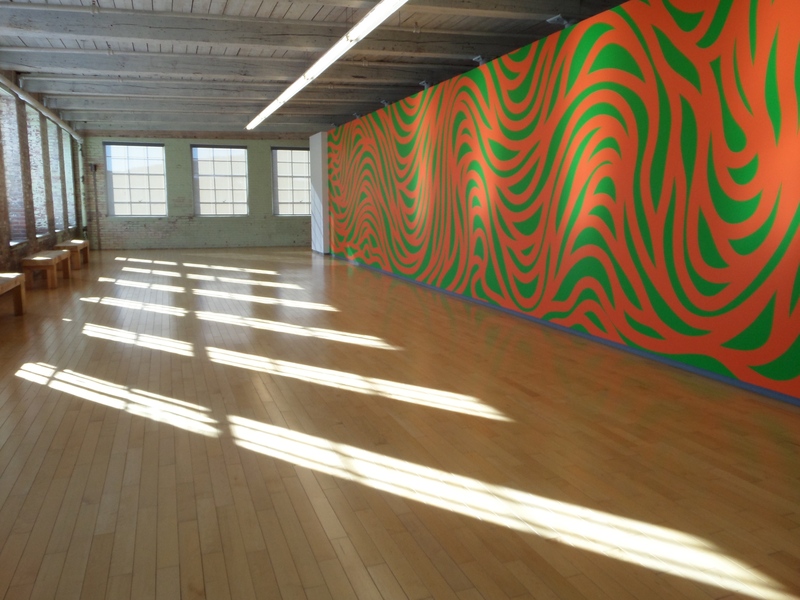 Swirling, spraying, wiggling: wall after wall after wall of gorgeous and intense paint by Sol Lewitt swims around me. Liquid looking gold and black (Teresita Fernandez) flow over me. 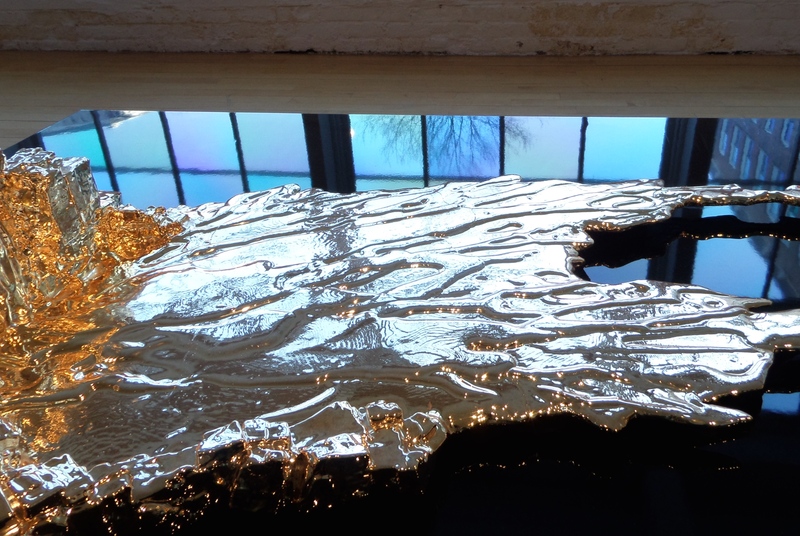 Teresita Fernandez: As Above So Below, Mass MOCA Winter 2015: window reflections in her black and gold sculpture. On the way to Massachusetts, a friend and I crunch through snow to meditate in the icy stillness of a small temple at the Grafton Peace Pagoda. 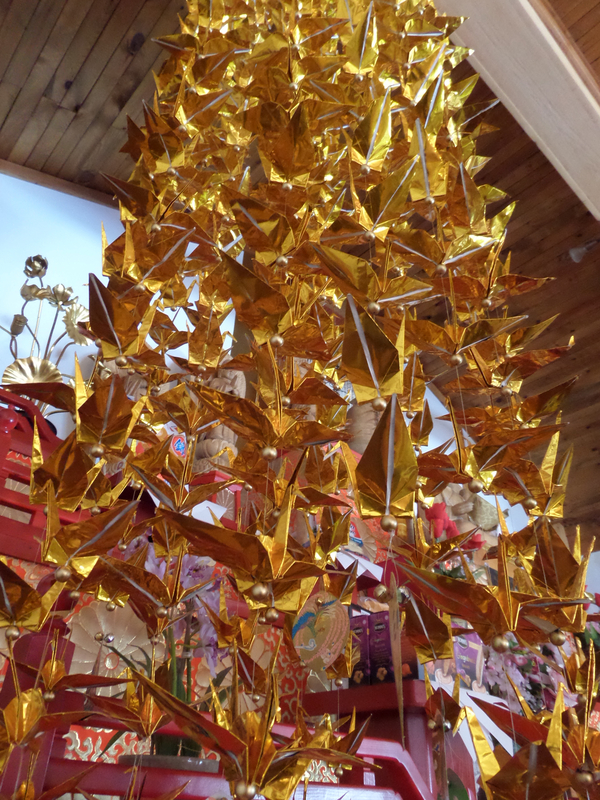 Golden peace cranes at the Grafton Pagoda temple. We are surprised by a Japanese Buddhist nun wearing a headlamp, who pops out from behind the altar where she’d been organizing items. She is startled by us. So cold! So cold! Come and have tea when you are done. After sitting zazen in the frigid air as long as we can stand it, we find our way to the kitchen, where we nibble a cookie, sip hot brown Kuchika Twig tea and get to know her—Jun-San. We speak of peace walks and meditation and the essence of the Lotus Sutra. My companion says, Ever since I first heard Na-Mu-Myo-Ho-Ren-Ge-Kyo, I have wondered what the words meant. She answers that it comes from the Buddha’s last teaching, where he moved from the internal, concentration on just the self, to concentration on the other, the community (something about the Golden Rule). She added: But really, you should not look to others’ translations because then the meaning does not come from within. The acts of chanting, breathing, sitting with its sounds reveal the sutra’s message for each individual. We laugh over it later: Here you spent forty-some years pondering, in search of what you thought was a mysterious, erudite, complex and distant definition, and she tells you you’ve had it inside all along! My acts of weeping, seeking color, meditating on life, breathing, walking and sitting with moments regardless of their pain or joy—reveal the meaning of those acts and moments for me. Wisdom inside of me all along. Color inside of me all along. Now my stomach and heart don’t go sour when I see the gray light over the gray hills and gray snow. Spring will come. Buddha statue at Kripalu, October 2013. The answer is inside of you. Accidents happen. Living long doesn’t always happen. I think of the children who come into our lives, how we are often trying to save them, sometimes not able to: horribly, sadly, naturally. We have saved them so many times to start with, watched over them, cared for them, taught them. And if they live, if it all goes as it often does—they can grow into gorgeous young people we adore, full of creativity and angst and love. We are called to pay attention to each day and moment, and to love: love and care for our individual selves as best we can, love the people we love, deeply, honestly; and not search way-out-there for meaning but find it right here next to us, in us, shining through us with unexpected color. Spring comes. But sometimes it is bittersweet. 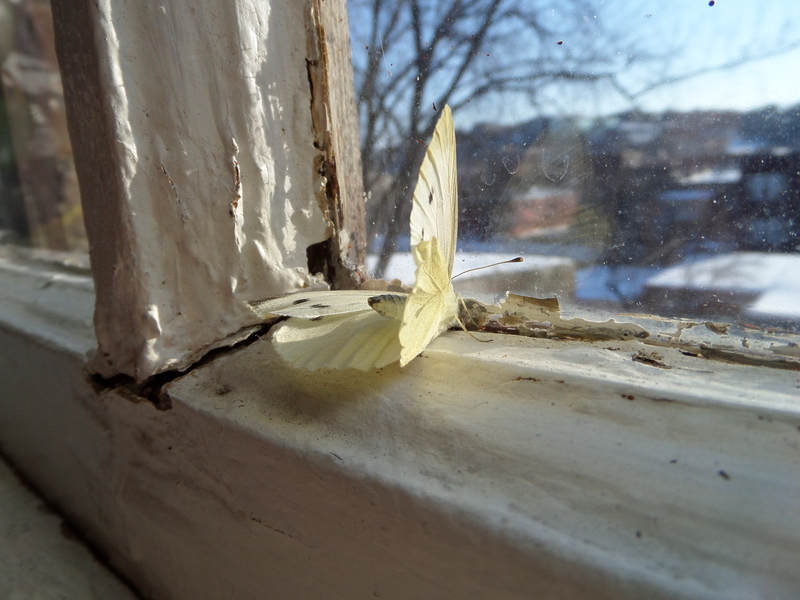 In memory of one Dainty Sulphur, who appeared unbidden in my apartment on February 11 and exited on Feb 28. In memory of a creative soul I never met except through his mother: photographer, student, beloved son, brother, and more, Max Maisel, who went missing Feb 22, whose memorial service was March 27 and whose body was finally recovered April 17. 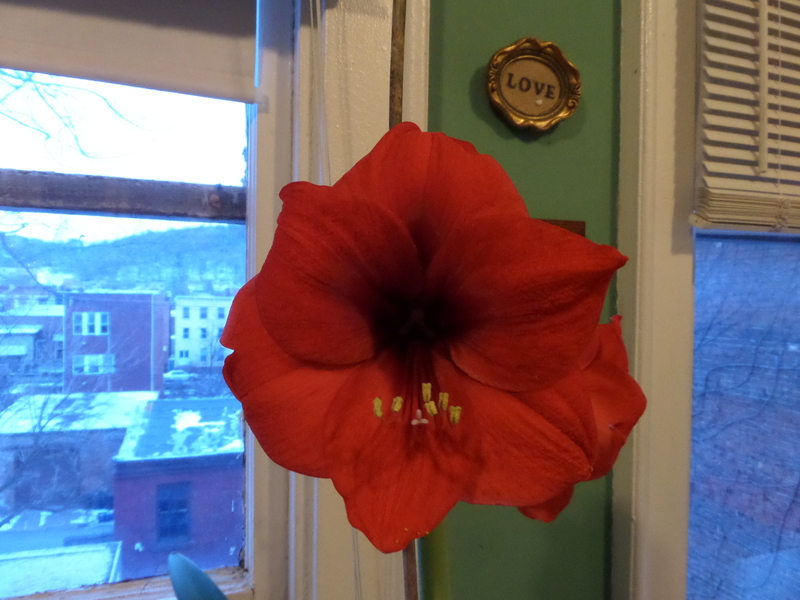 The amaryllis I theorize brought the Dainty Sulphur butterfly into my winter apartment. 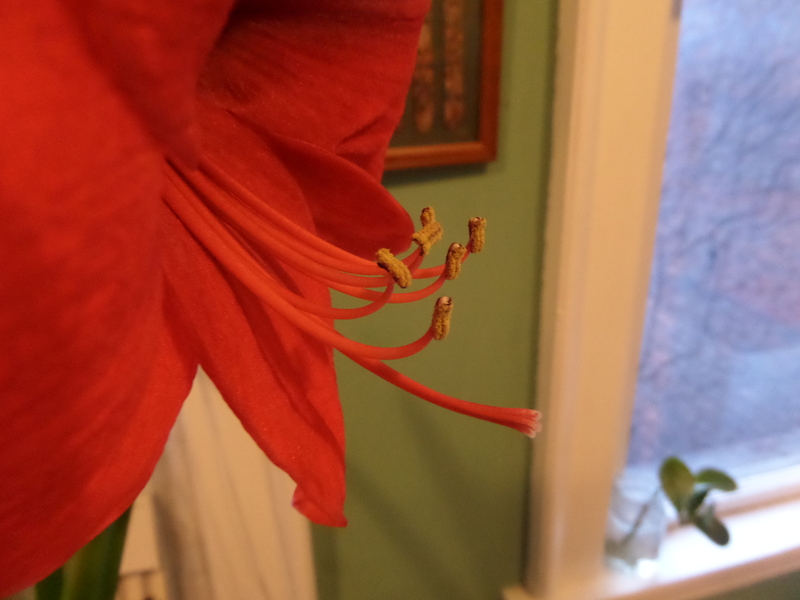 …and caused me to study the tiny details intently, while I could. Friday, February 28. I put her in the yoga room, the sacred space, two days ago on the 26th, resigned that she was almost gone—but yesterday, I literally leapt for joy; she’d only had her antennae tangled! Parts of her were not in as bad a shape as I had thought. Of course one of her legs was still detached, and her energy very low. Then last night I couldn’t find her. I looked under the radiator again, all over the floor, worried I’d step on her accidentally. Finally I figured she was, well, gone. This morning I found her in the stones again—was she there all along and I couldn’t see her? or did she go someplace and then come back? 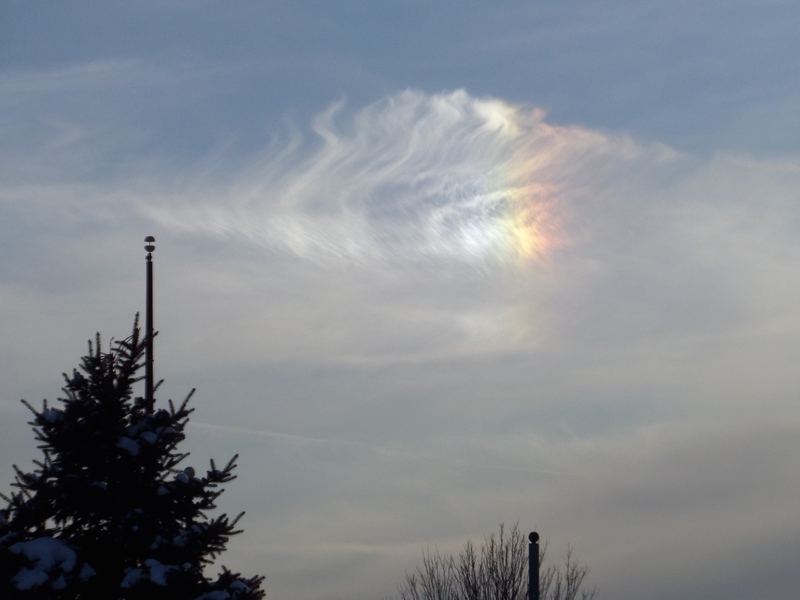 However, she was barely there, not responding much to air movement or things around her. Later, nothing: the end. Death. Dainty still faced the sun, wings folded, but slightly fallen over. I’d felt such surprising happiness the day before; just to have her there, alive, made me feel hope about the missing boy, too. But then the next day–today–she’s done. It is empty in the kitchen by the window. It is empty in the bedroom. It is quiet, as quiet as it was before, but different. Yes, there are plenty of bugs in my house I don’t see. Outside: squirrels and starlings, crows and chickadees; robins yet to come. But no one else just showed up uninvited, spent time alongside me, and gave me so much to think about in the iced over, snowbound, super chilled air of this February. What feels miraculous, and is yet usual: life, and death. Max is still missing. I ache for his family, I ache in their exposed place—exposed in the media, in search of possible information—exposed in their pain and mixture of hope and dread. I admire their courage and ability to appreciate those who assist and accompany them. I fear writing the saccharine, the simplistic. I don’t know what this feels like for them. I dance around the edges of it, and even that makes me stagger in grief. The bowl of winter sky and winter sun and winter trees and winter snow, when it was at least warm enough to get outside. Thursday February 27. Oh my god I am so tired, and everything feels a mess. I stomp around my apartment because it’s too cold to hike; I’ve pulled out papers to sort and they are scattered all over the floor and dining table and front room and I am so mad and sad. My logical mind knows that Max probably drowned, falling off the pier into the lake. He might have accidentally slipped; it could have been on purpose. Regardless, he has not been found, and I feel worn out by the weight of all of it. I want to get ready for another friend’s upcoming visit, but I can’t cook anything, even with that new equipment I bought the other day. Instead, I cry. What do you do, as a parent, thinking of another parent’s pain? I Google-chat with my son across the country and he is ok and I’ve texted my daughter and she’s fine, and now I sit with my dying butterfly. Struggling against the cold, scraggly like the window paint and the aged snow outside. Dainty was at the window, fallen sideways and I offered her sugar water on a Q-tip but she wasn’t interested. I noticed she was missing an antenna, maybe one of her mid-legs too, and she could still flap around but is clearly leaving this life. So I brought her into the yoga room, a sacred space and a warmer one too. 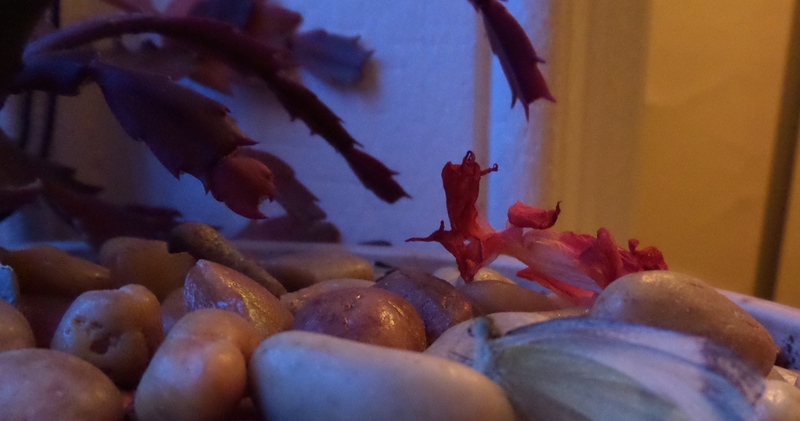 She is resting in the rocks of my newly blush-tipped holiday cactus. Dainty still wiggles her remaining antenna around and holds onto some pebbles while propped up slightly by others, facing the window where there is only gray clouded light, as there has been all day. I hate the metaphorical consonance, of the butterfly fading away and this young man and where he might be. The thousand thoughts of what might have happened to Max bombard me, shred my breathing. He wasn’t meant to be like a butterfly, and he wasn’t meant to die before his parents. I feel trembly with fear and uncertainty, on so many levels—for his mom and dad and siblings, even for myself and my own future. I have to wander my living space or just watch the world out the window, and in this moment, not worry about getting work done. Yes, the sun rises over the hill. Every morning. The blizzard of papers has blasted my household white inside to match the outside world: a bin or two of memorabilia, trips taken and ticket stubs from movies, but also official forms for insurance, old records from my divorce attorney and previous illnesses and surgeries, a health care proxy yet to be filled out. Wondering about choices, mistakes, missteps, amid the things that just happen. My mis-steps, Max’s mis-step. Things-that-just-happen. Concentrating on seeing the beauty in the dark and white: Chance blows snow this way, melts it that way, hardens it into curves and blops. When I first brought the butterfly in the yoga room and then left, she must have fluttered and fallen to the floor. I brought her back up to the light. I hope that wasn’t too meddling; just didn’t want her in the dust and dirt, in the dark. Can a butterfly sense such a thing in the same way we do? Does it yearn for light, instead of seek the shadows to die? I smile that she has her single antenna up strong and even moving a bit, feeling the air, moving her fore-legs slightly. She is alert, in the world, yet. BE-ing. Even as she is dying. Aren’t we all, as we age and change and become “less able,” still very much here? Aren’t we all, as we develop into elders, crones, and Wise Ones through our aging, becoming masterful and more able in other ways– and still very much here? Even if we aren’t “very much” presently, we HAVE BEEN, and ARE here; we create ripples in the world, into the time when we are not here. My candles are lit, and I continue to sit with aching muscles and aching heart. The blur of butterfly in the dark, and a fallen cactus flower. 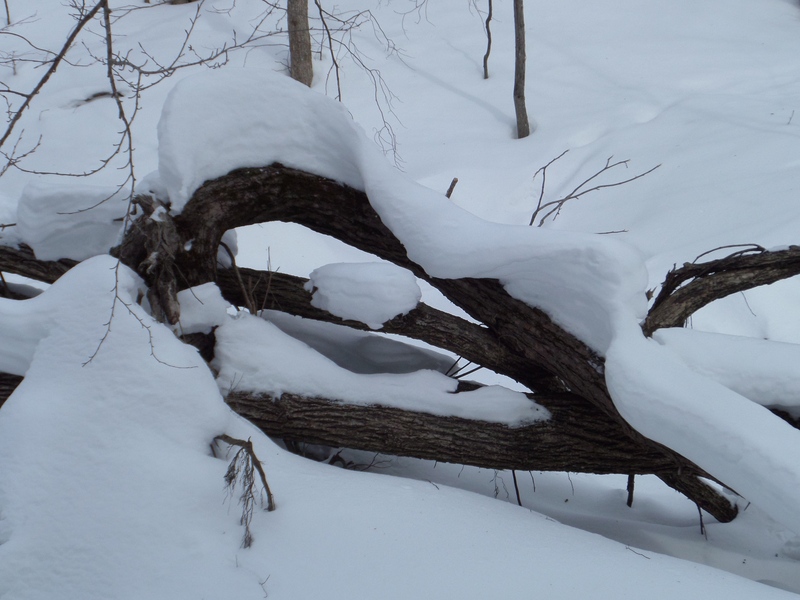 This week, I signed up for my fifth growing season at the Community Gardens, while almost two feet of February snow drifted down to cover the ground. 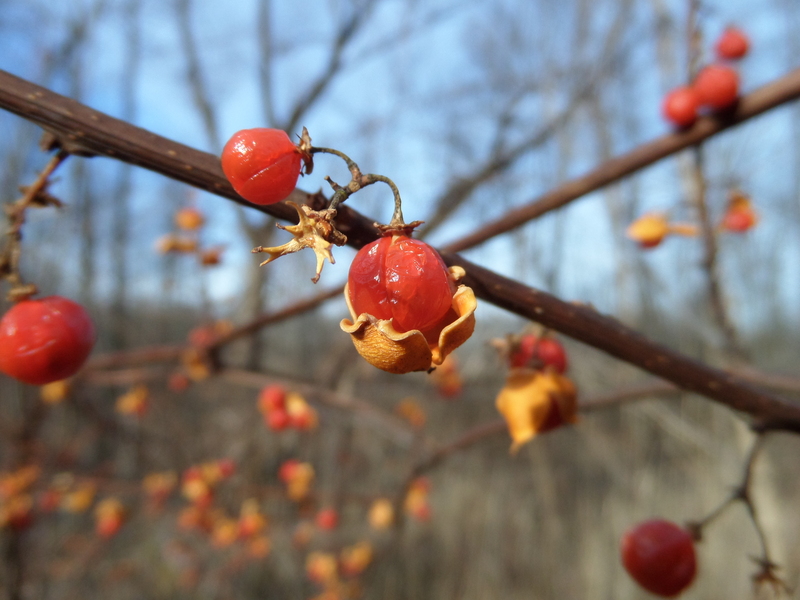 But back in mid-November, there was that look of fall about the garden. A slight wind tripped brown leaves up the hill behind us; in the other plots, with corn stalks and fencing gone, minimal crops remained: brussels sprouts and fountains of purple, Russian, and curly kale. 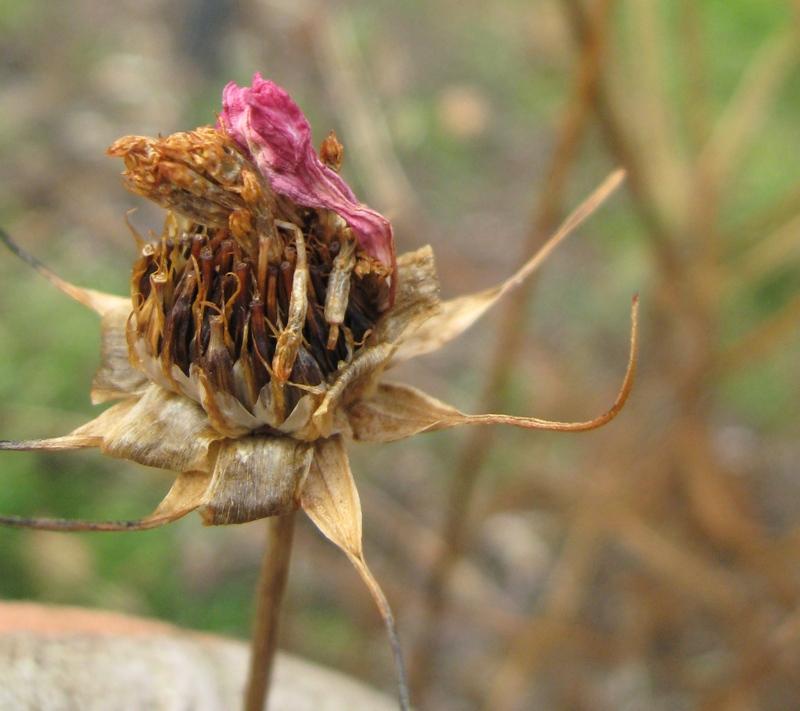 In my own stripped plot, where we had gone to put the plants to bed, where we expected only the dead ends of things? Surprise! Lacinato kale. Lots of it. Not huge forests of kale, like that which flourished for my more accomplished gardening-neighbors, palm fronds off tall woody stems. 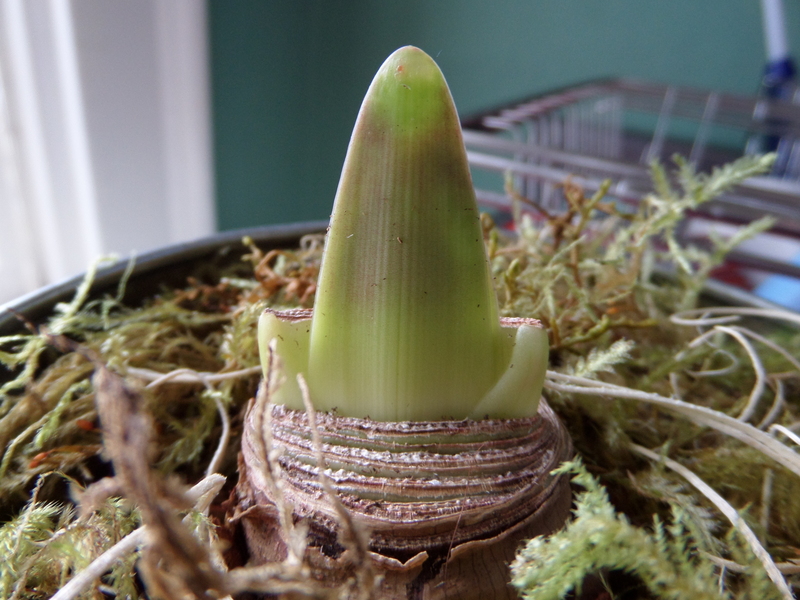 But mine was beauteous, dark green and standing proud, though short in stature. A miniature field of somewhat miniature lacinato kale. 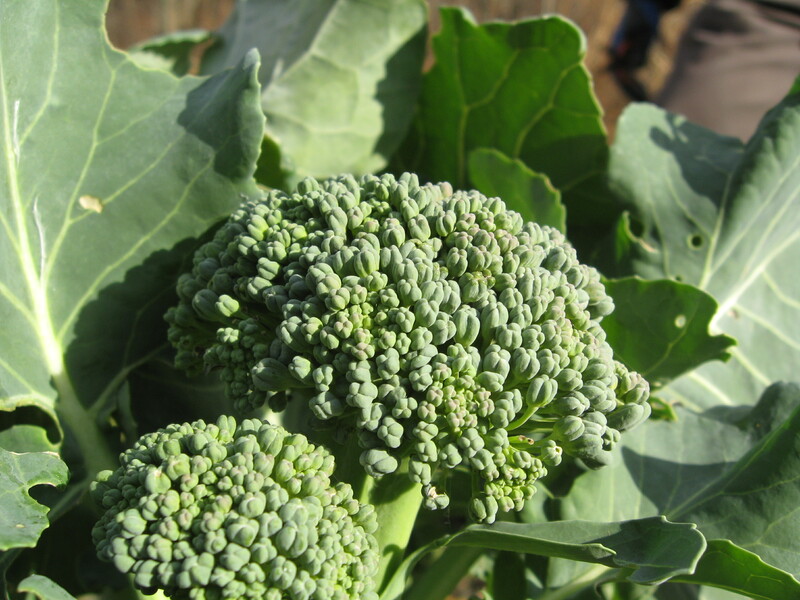 Broccoli, presumed spent, had also revived while I wasn’t looking, and grown several small wonderful heads. 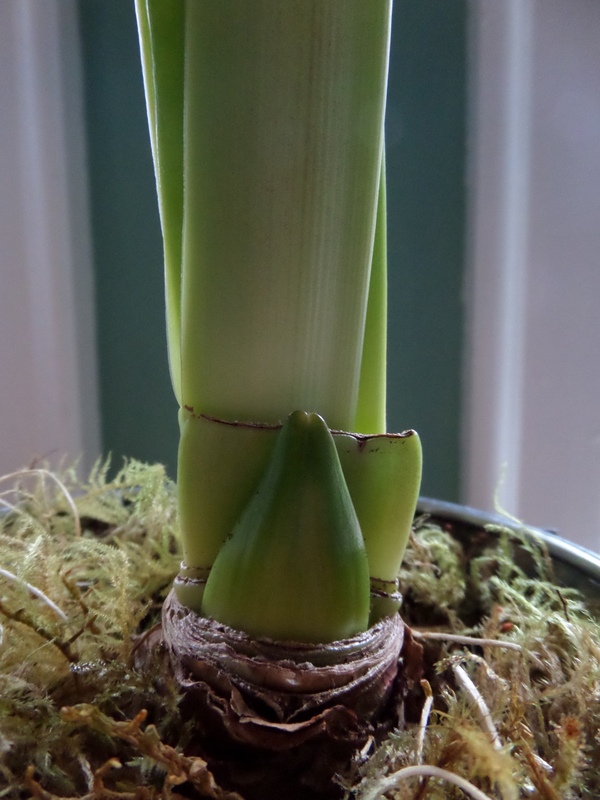 In addition, the chard had sprung up again. Like those weeds we had anticipated. The garden mate was a little grumpy and tired in the November cold, but my joy over un-anticipated produce, in addition to the afternoon sunshine, soon made him grin. 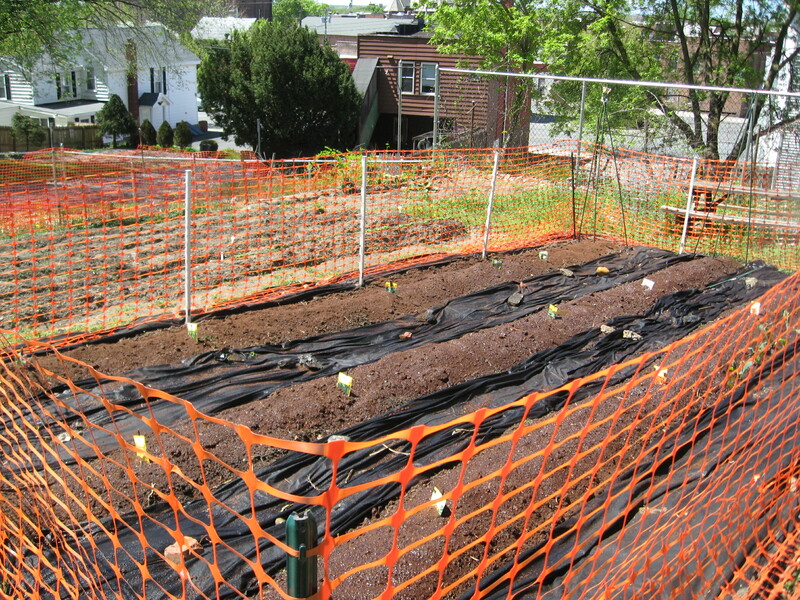 We tugged up the ugly but functional orange fencing, along with the dirt that matted it down. Splattering soil across our faces made the work curse-worthy, and we did: splatter and then curse. Again and again. We yanked out the wilted but sturdy stalks of cosmos and bachelor buttons, noted that some purple alyssum still colored the ground, and used the picnic table to lay out fencing and roll up, roll up, roll up. The sun went behind clouds just as the last bundle of fencing went into the shed; we gathered the reusable plant markers and piled up the rocks and bricks that had pinned black weed-suppressing fabric between the rows. I had grand plans for follow-up soil amendment, garlic planting, and weed abatement. They didn’t happen. 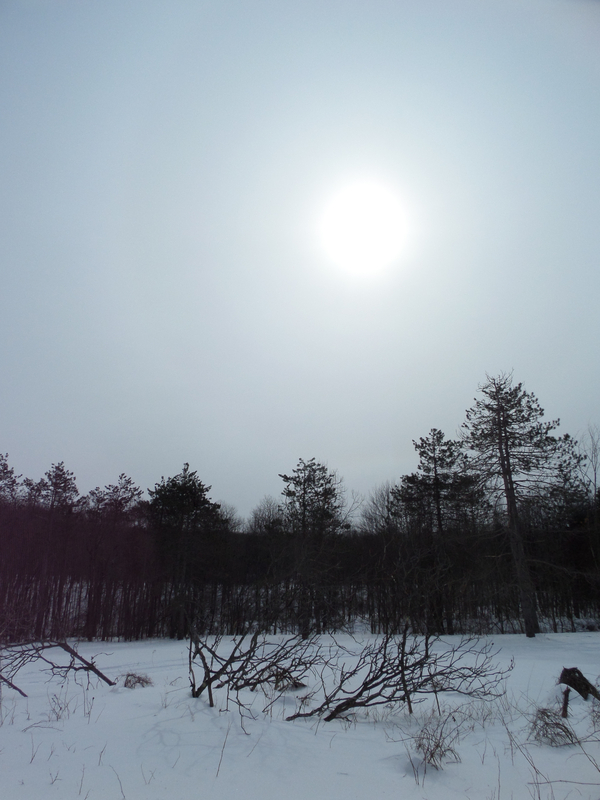 The sun stayed behind the clouds and within a few days, it dropped well below freezing. At the end of my fourth year, I’d gotten good at fencing and set up, more-regular weeding and harvesting—but the end of season jobs? Like the rest of my life—still working on it. Late afternoon sun on a floral arrangement of lacinato kale. The overflowing harvest basket sat in my dining room for a few days before I bundled the huge haul into the fridge. Bunches and bunches of kale and chard were washed then stir fried lightly or blanched, and packed into freezer bags. The first one came out at Thanksgiving when my daughter and I mixed some chard and kale to make her favorite “spinach” au gratin. 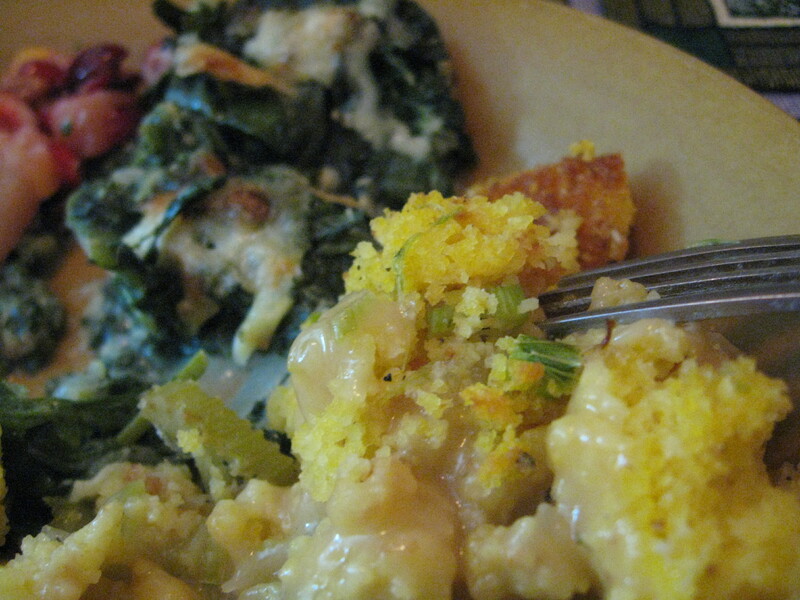 Thanksgiving’s gravy-splashed corn bread with kale au gratin in the background. After her too-short visit, a piece of bad news slammed into my life and sank me in a pool of old grief, where I sat like a drowned stone. None of the activities that had appealed just hours before seemed worthwhile. Soft sleepiness from holiday exhaustion along with that day’s prospect of a lovely nap all dribbled away. What To Do. Or Not Do. Radio? TV? No distractions promised help. I chose instead to consider the frozen leftovers from Thanksgiving. I pulled out broth, simmered carefully from the carcass of the very expensive, very local, very delicious turkey (roasted with an onion inside and basted every thirty minutes for five hours), a good portion of which had been devoured with that yummy kale au gratin, and also cranberry orange relish, sour cream mashed potatoes and veggie-studded cornbread stuffing. To the broth I added some trimmed cauliflower previously destined for curry. Then little nubs of carrots from my garden, also trimmed carefully. Turkey, kale, carrot, celery, cauliflower soup, after it was packed up for the fridge. You grew this. You harvested and washed it. You made this. ….You can make things again! Next I added an onion, and diced the package of celery left over when multiple people provided it for the Thanksgiving stuffing. 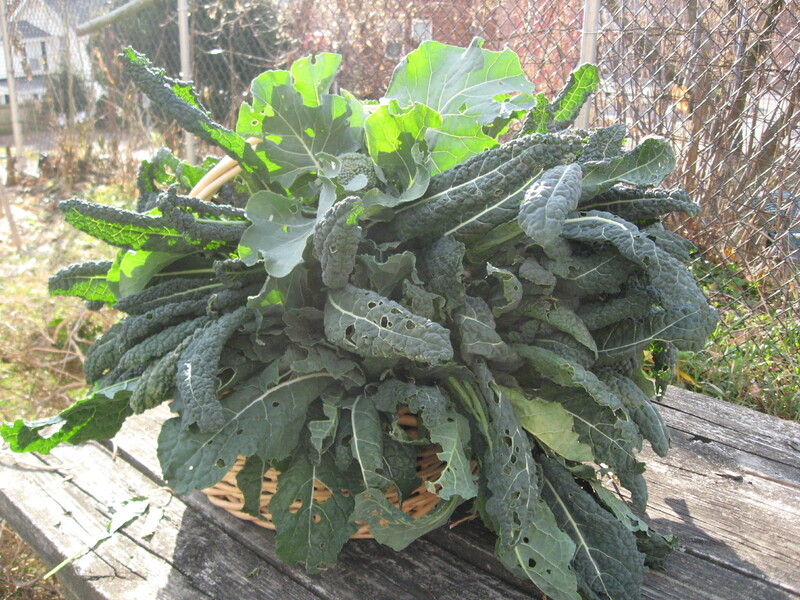 Finally, lacinato kale, again, that unexpected end of season harvest, when I thought it was all gone and there was a trash bag full, handful after handful harvested just before a hard, hard freeze. 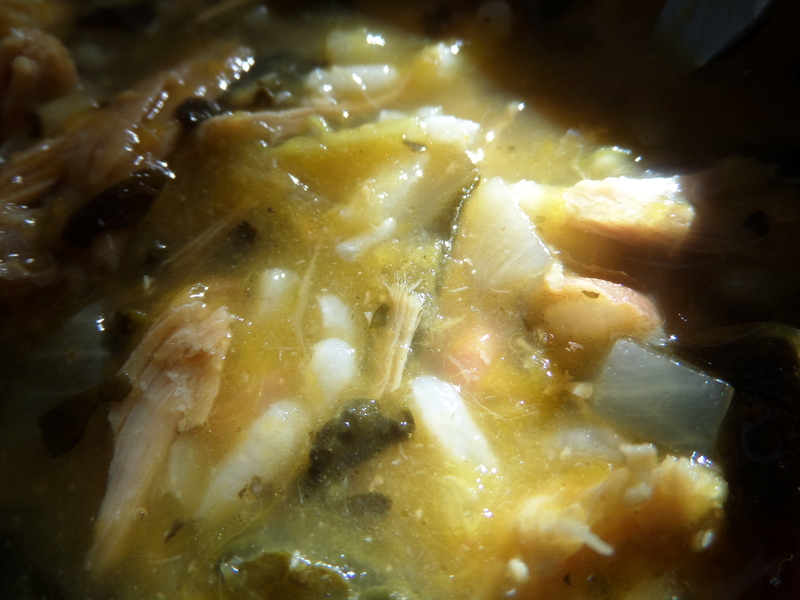 Even later–January’s turkey, kale, onion, garlic soup, whisked with steamed winter squash, and a few white beans thrown in. You grew this; you cared for it, just like your life. You can come back again, regardless of setbacks. You have the ingredients. Your life is rich, with not only your own garden’s production, but other people’s plenty. Look in your cabinets and freezer: basil and apples and sage and parsley, peaches and rhubarb and collard greens, all gifted to you. There is enough. More than enough. Preheat the oven to 425°. Sauté until translucent 1 cup finely chopped onion, in 2-3 TB butter, light butter or margarine. Mix in 1/4 cup flour and 1/4 tsp fresh grated nutmeg and cook for 2 minutes, stirring. Add 3 cups milk and cook until thickened, 5 to 7 minutes. Defrost three pounds of frozen chopped spinach–or a mix of spinach, chard, kale or other chopped mild greens. More is possible, too! Squeeze out as much moisture as possible (you can save for cooking soup later if you want) and mix it into the onion roux. Then stir in 1/2 cup freshly grated Parmesan cheese, salt, and freshly ground pepper to taste. Put in large baking pan and top with 1/4 cup Parmesan cheese and 1/2 cup shredded Swiss Gruyere cheese. Bake for 20 minutes until hot and bubbly. Serve hot. Makes a little over 6 1/2 cups–or more if you are generous with your greens! 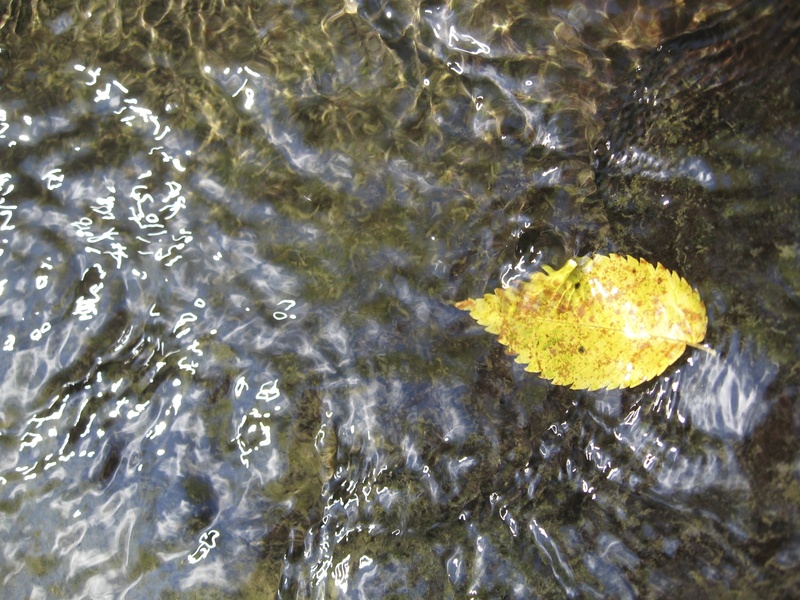 Oscillation of water, like sound, washes over fall leaves, at Partridge Run, Berne NY. I have always been told I couldn’t sing well; whichever octave sits next to me is where I jump, and I waver when unsure if another note might be closer. I’ll sing snippets with my CD player or part of a hymn I’ve practiced a hundred times, but only when I am fairly confident I will land correctly. Still, I wibble and wobble. But at yoga school, chant began our day. I had to open my mouth and make sound come out. On-target or out-of-key, it didn’t matter; first thing, we intoned “the resonance of the universe,” Om, followed by three Sanskrit stanzas of the Student-Teacher Mantra. Almost sixty of us perched sit-bones on little black cushions while out the window, sunrise pinked the eastern sky. The mantra song felt strange to many and made them itch in discomfort and wiggle like little kids. Mountain fog dissipated into the evergreens while our eyes remained closed, or followed the lines on a large-print poster at the front. Over twelve days the chant became more familiar. 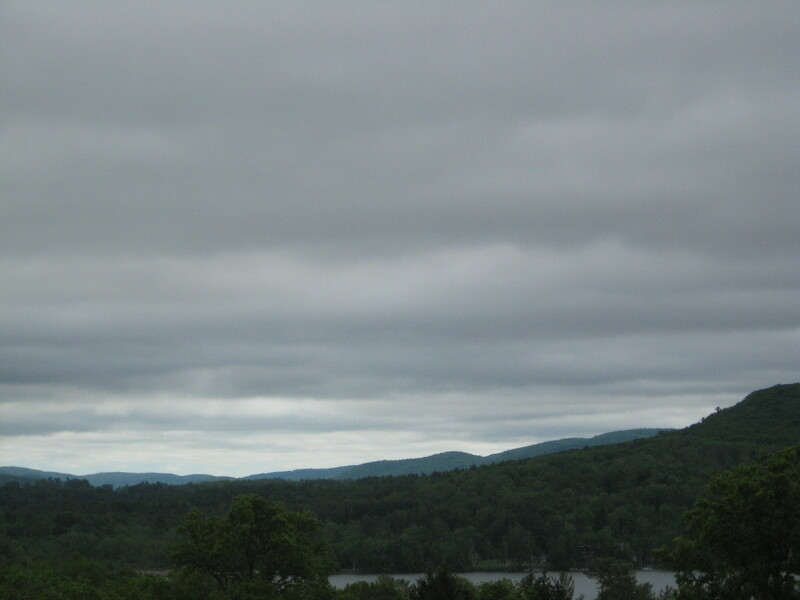 Clouded Kripalu morning over the mountain. During the break between sessions, I committed to continue, using a grainy digital video I’d recorded at Kripalu. At that point, I needed to be led. By the third stanza, usually my throat hurt. I tried again every daybreak to coax energy, with a vocalization some mornings tentative and froggy, other times expansively bouncing off the yoga room walls. Breath slowed and deepened out of necessity, and warmed my throat. Warmed my thoughts toward myself. This was not just a tune. Then came even deeper breath and movement, heat, circulation and all the good invited onto my mat with those sensations. Finally, my nauseated frustration flirted with comfort. I recognized unwanted thoughts and let them float away. 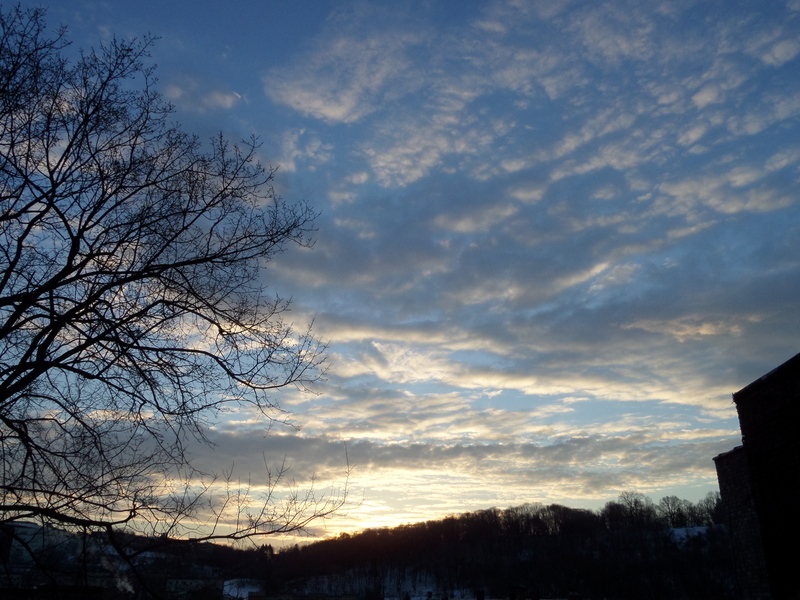 When we returned to Kripalu, I heard my morning voice steady and confident. 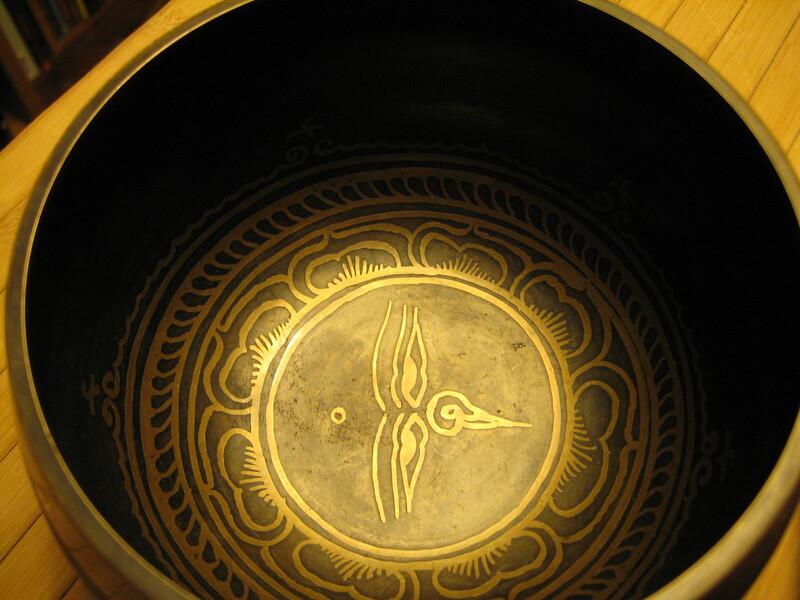 Tibetan singing bowl with symbol of wisdom eyes. Now out of school, why do I do it? One afternoon I sat in a kitchen that reeked of the detritus of cooking, home early because my therapist forgot my appointment–what deep things does THAT say? I asked myself melodramatically. Basil stems and onion ends needed to be taken to the trash, cabbage bits and tea leaves laid sodden in the sink, crumbs sprinkled the table and floor. Earlier I’d stopped at the used book store and found two 25 cent paperbacks for the lake-vacation planned with my best friend. But at my table I acknowledged it was a vacation she and I would have to put off–because her brother is sick, so she will instead drive five hours back and forth to him a couple days a week, and then to doctors and hospitals in search of diagnosis, prognosis, the plan, whatever-that-plan-might-be, however long it might take. Because of love. How can I make my life like a vacation without a trip? Give yourself permission, my therapist might say, like the night before, to stay up and crush the basil into pesto, to cut the watermelon and freeze the grapes for hot afternoon snacking, to wash the lettuce–but also to toss the sprouting sweet potato, feel the sticky floor under my feet, acknowledge I ate maybe one too many pieces of the blueberry buckle baked in the beautiful dark. Feel it all. 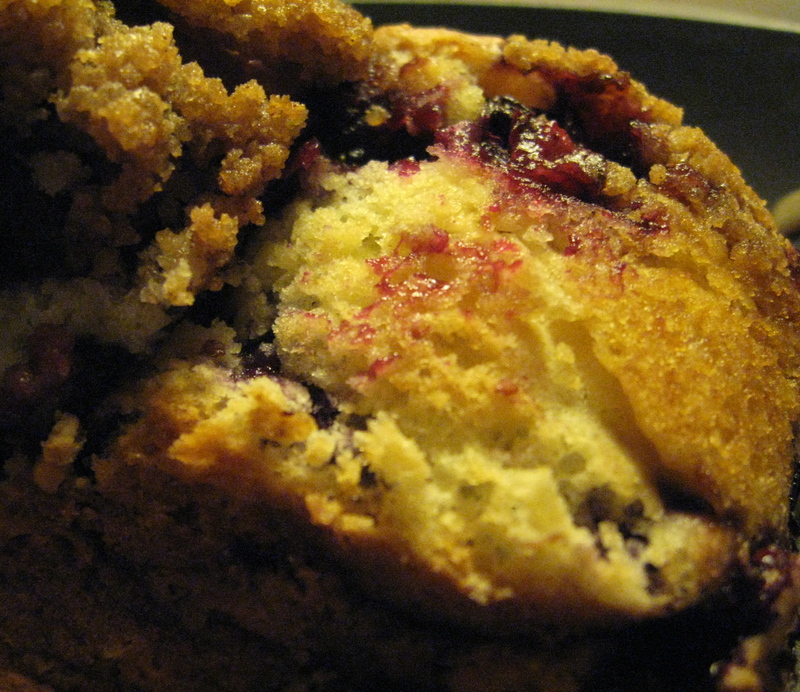 Blueberry buckle: crunchy top, tender crumb. I had given the therapist some blueberry buckle as we laughed over the scheduling error. I thought, I would send some to my best friend if I could fly it there. In the midst of her pain, she’d mailed me a royal blue Pashmina shawl; the card read: Wrap yourself in this hug from me. I want to take her to the lake we’d planned to visit, to hear the loons and go on long photo safaris in search of wild flowers and angles of light, to huff the thickly oxygenated Canadian forest air. Drape myself like a scarf around her sad, sad shoulders. Feed her blueberry buckle and sip Chambord into the evening, watch the hummingbirds and fog dance in over the beach. That’s why I chant. I chant to create space, to feel distress and delight. I chant, holding my best friend close, and her gravely ill brother. I chant and remember my friend J who died a year ago this month. I chant love gliding out of me for all of my existence. I chant into the lakes and ponds and rivers and creeks, up the farmland and mountains, through the cumulous and wispy and mackerel skies. I chant into my cells, lungs, intestines, skin and fat and muscle. Into my toes and fingers. Through my navel: center of gravity, center of balance, center of self. Then out again and out again. Stretch, release. Expand, contract. Time passes and I am inhaling, vibrating, exhaling, feeling. Time passes and I am in my breath in my body so time is inconsequential. Chanting beckons me back to the mat and back to myself. Chanting opens me with sound. So most mornings, I chant. The visual zing! 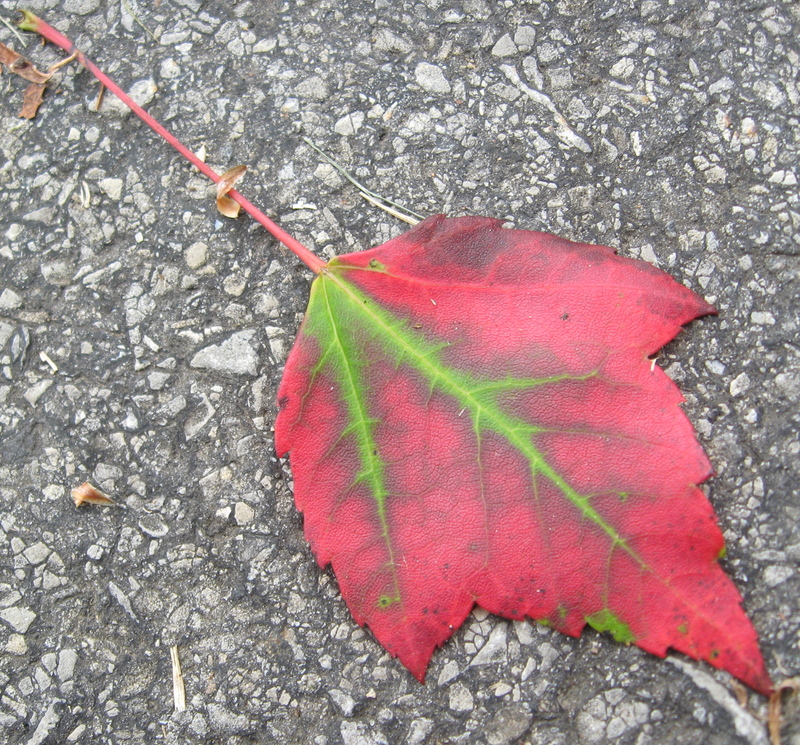 of fall; a path of green revealed by seasonal red. The container that got me to thinkin’. In my continuing quest to clean out kitchen drawers and cabinets, today I came across a glass jar. When I lifted its clear pear shape to the light, sediment clumped on the bottom and its once luminously deep red contents read cloudy and brown. The faded Sharpie writing on the lid, in my hand: Sour Cherry Syrup 8-17-03. That’s 2003, ten years ago this week. It’s the very last jar, of the very last jars, of my Michigan and Illinois canning years. I learned to make preserves in 1989, when I lived in mid-Michigan with one small child and another on the way, and a spouse in graduate school (soon to be in medical school). The trees in South Haven and along Lake Michigan were studded with peaches, sour cherries and other stone fruit; I’d drive east as each came into season, or search out flats of fruit in the local market. Peaches were the first item I mastered how to slice, cook, pack into sterilized jars, and boil in a water bath: peach halves in sugar water, peach jam, peach-apple chutney. Next, I expanded my “putting up” to blueberry and strawberry preserves, then hot sauce, and bread & butter pickles. But sour cherries were my favorite juicy treat. After we moved to Chicago, I could still get cherries, thank heavens. Some farmers would bring their wares up to the north side where we lived and from one farmer in particular I would order a 40 pound box of pitted and frozen cherries, available for pickup in mid-August. Defrosted cherries would bubble along with the pectin thickener and cup after cup of sugar in a huge cooking pot as the canning day progressed. Mason and Ball and “Atlas StrongShoulder” jars were filled with the concoction, screw-tops carefully put on and the jars lowered into the water bath. By early evening, rows of glistening glass had been pulled out and placed on a wooden rack, out of any drafts in the steamy kitchen that could crack a jar that cooled too quickly. Within an hour, always to my great relief, lids began to thwip down in a vacuum seal; knowing at least a few had been made safe for long-term storage, I’d shower and go to bed as the thwips continued into the night. Next morning the lids were wiped off and, one by one, labeled with that ultra-thin black marker, then placed for storage in cardboard boxes. In addition to dozens of finished sour cherry preserves, some jars would hold only syrup, scraped from the bottom of my white enamel saucepan, when the solids were gone but there was still thickening ruby-red syrup I couldn’t bear to waste. This jar was just such a jar. The week it was sealed was a usual week, back in 2003. My calendar tells me I’d weeded the hostas and wildflowers in the front garden and the kids’ long anticipated beach day was cancelled due to rain. I’d bought the pectin and sugar on Saturday, and picked up the cherries at the Skokie Farmers Market on Sunday after church. A third year medical resident by now, my spouse had been on 24-hour overnight call in the hospital Tuesday and then that Sunday. 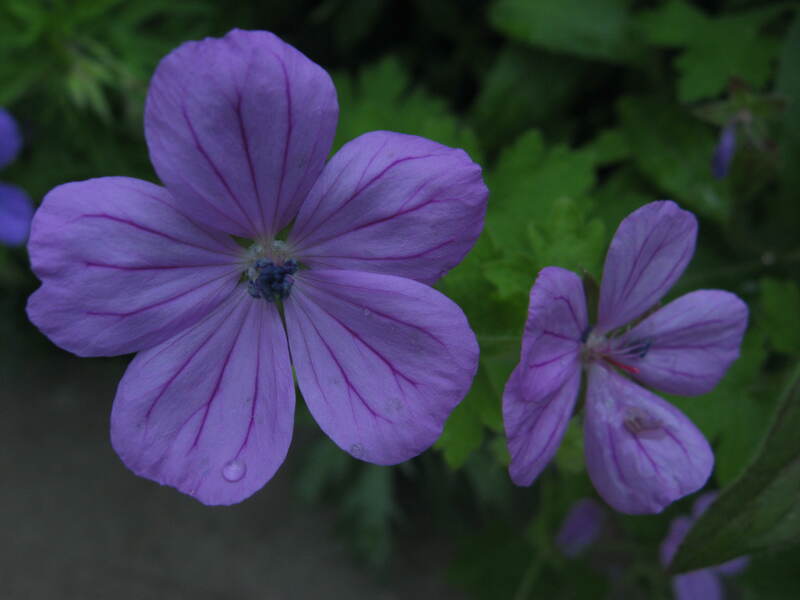 Wild geranium (also known as Cranesbill) from my Illinois garden. The following week 15 clients showed up to my massage practice, martial arts classes and a Renaissance Faire filled the kids’ days, and the spouse was gone for two more overnight calls. 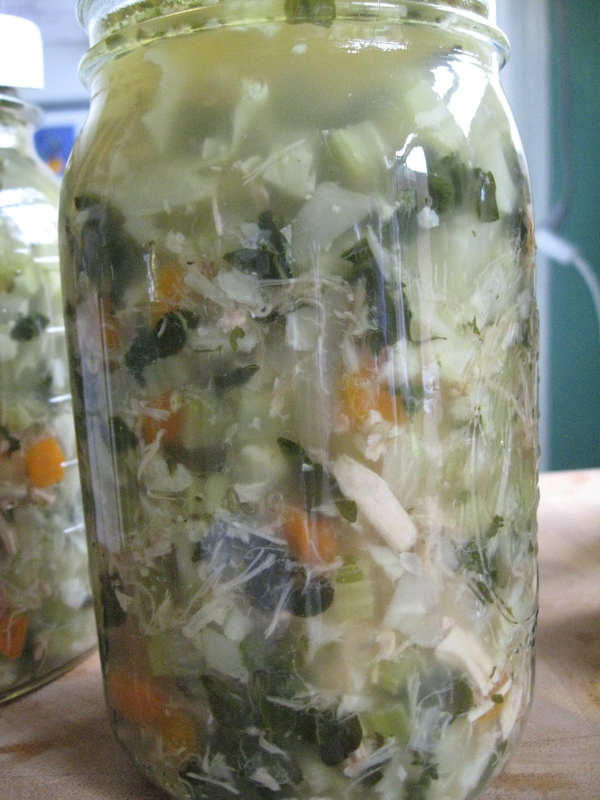 All that activity was, I am sure, flavored with the typical couple of jars that–darn! we’d joke–didn’t quite seal and–double darn!–had to be used up right away. We grinned over buttered toast topped with cherry preserves and later each day cherry syrup in seltzer or cola or on ice cream. 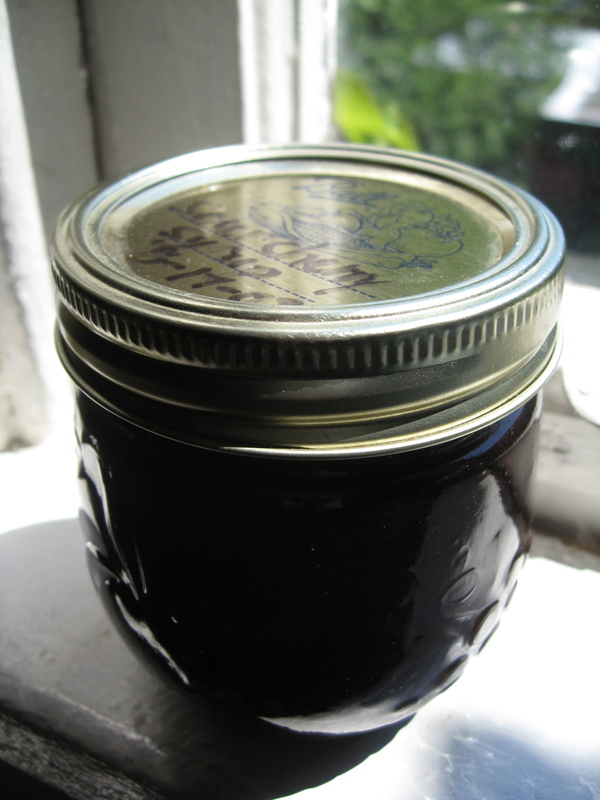 I put up preserves and syrup summer after summer until 2009, when I moved our family household to New York, and then the spouse left, to do permanent overnight call, with another woman. My first response, finding that lonely jar this August? Oh no! This will be the end of it! No more, those golden summers, that delightful food, all gone, along with the family life before empty-nesting, before a new state, before divorce. In fact, this last jar is probably useless, not safe to eat. I’ll open and sniff it, then pour it down the drain. But my second response? I’ll dump and wash that jar and store it with the others up in my closet, boxes and boxes of clean empty jars waiting for fruits to ripen. Perhaps something novel should be put up in those Masons and Balls and Atlas StrongShoulders: plums? pear butter? cinnamon applesauce? Or maybe I’ll call that farmer who delivered in Skokie, and ask if he ships to New York. 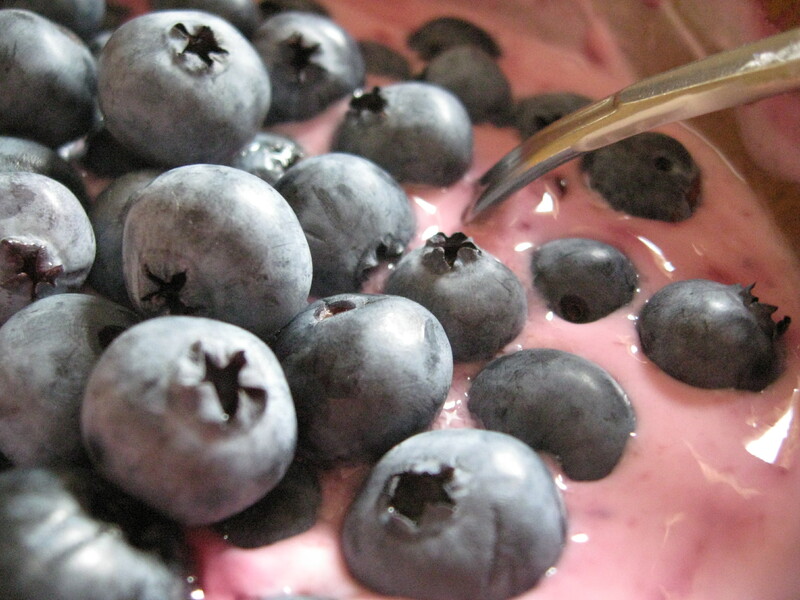 This season’s blueberries, floating on top of Greek yogurt blended with some home-made blackberry preserves. Monk’s Pond, Kripalu Center. 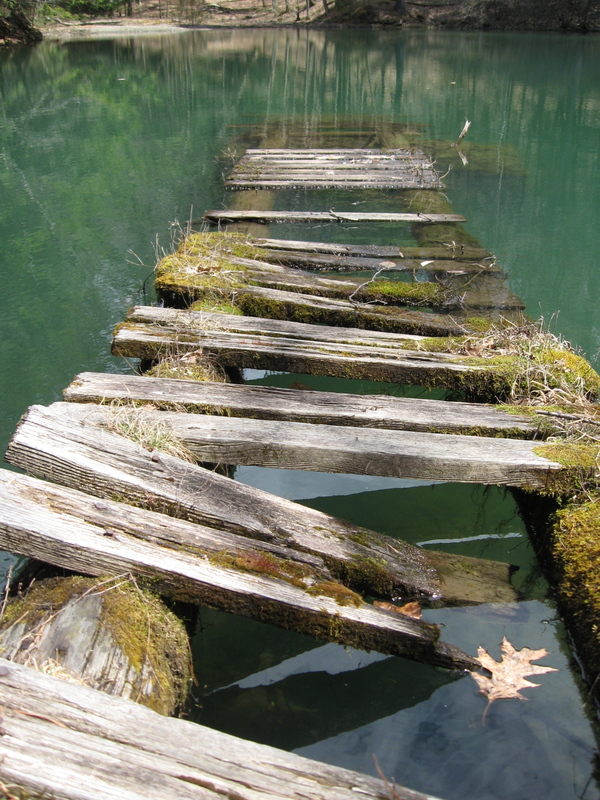 Two possible paths in learning, and life: I could worry about stepping perfectly from one broken-down, submerged plank to another, or choose to play, expecting to fall in, enjoying the exploration of balance. Especially taking in the part I’m most scared of initially: getting wet. 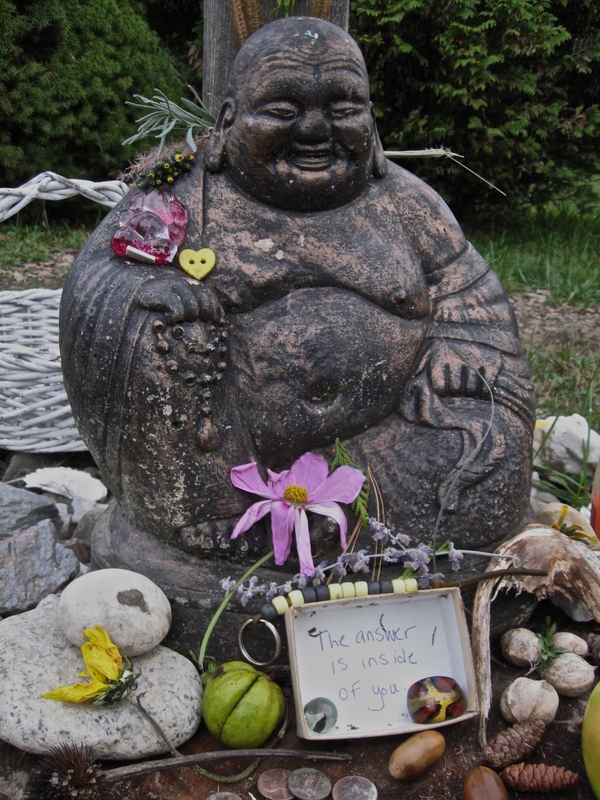 April’s training at Kripalu once more flung me deep into non-ordinary time, like the months of grief around my friend J’s death*; with much to say afterwards, and yet so much unprocessed and unwritten-about. I’m stymied in the richness of my adventures, and exhausted again, still. Information, information, poured in for twelve days. From the senses: exotic dishes on the buffet, hiking to jade-green ponds and a blue mountain lake, new faces to learn, voices, expressions, chanting, body movements and stretches and muscles micro-damaged then self-repairing; loosening of muscles and expectations. From the emotions: old frustrations hidden in the back and neck, released!, even-older habits of perfectionism popping up and rejected repeatedly. From the intellect: how to memorize? how to rework language? philosophy to examine and reject or accept, examples to wonder at and incorporate. We fifty-some students were fed and watered on a regular schedule: yoga now, eat now, learn now, more yoga now, eat now, learn more, sleep now. Sometimes I opted to sleep instead of eat, as the fifteen hour days wore on. We studied (or not), absorbed information, wept, breathed in new ways, chattered, practiced asanas, laughed, walked the labyrinth, mused, closed our eyes a lot, danced, practiced teaching, meditated, listened to each other’s life stories. 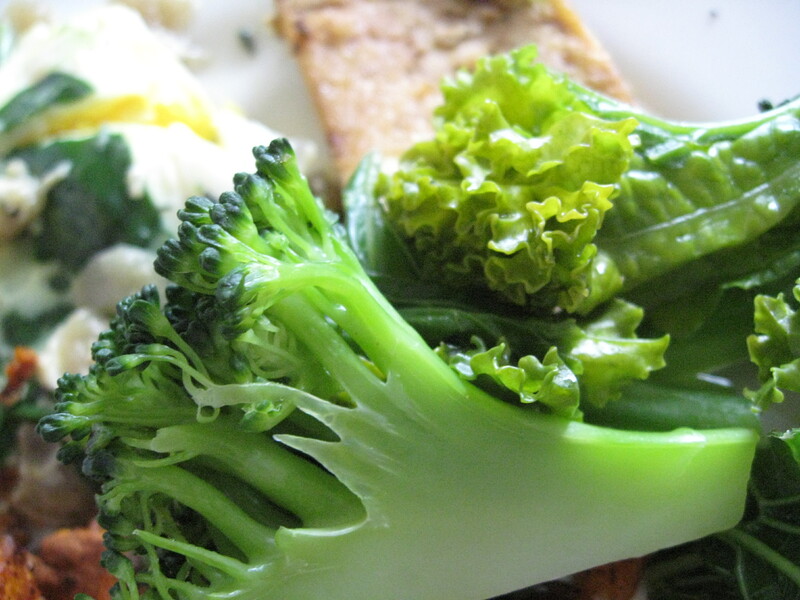 More to come about the food–but here are the staples of broccoli and kale. I ate kale at every meal some days. Including breakfast. Yum. I’m groggy coming out of school, as evidenced by my writing: incomplete phrases dangle, run-on sentences jackrabbit ahead. Regular life assaults me while I self-challenge not to leap recklessly into the old hurry-hurry. Yet requirements push impatiently through the door as I bring my luggage in: lists, schedules, topics internal and external: what for dinner? hmm, those piles of unfinished projects, cleaning; oh, and here come other people, can I handle interaction? Another fact reverberates in this bumpy integration: I return to Kripalu in June for a second round, and preparation is required in the form of teaching practice, absorbing a three inch binder full of materials, memorizing Yamas and Niyamas (Character Building Inquiries of Restraints and Observances), becoming familiar with even more poses (seventeen asanas down, twenty-six more to cover in June). And most important for me: the internal dialog shift. Teaching is not giving a performance, it’s having an experience. Breathe and meditate first. Breathe and don’t take yourself so seriously. What do I experience in the moment of teaching? How can I flow with self-awareness along with students’ needs to understand? What about timing the various sections of the class, and whoops! I need to use a new kind of language–not the language of anatomical teaching from my former days in massage therapy but rather directive, guiding phrases to move the participants to internal sensations and lack-of-self-judgment–yes, language cleaner yet more poetic. Months ago, coming back from Kripalu, I didn’t realize how painful it could be to re-enter regular life. ** So this time I moved back into the world deliberately and slowly. –A zen motorcycle ride to Saratoga Spa State Park; moving meditation different from the yogic variety, world going by but not attached to it: smells of cut grass, newly manured fields, flowering crabapples and Japanese plum, all cascading inside the helmet, forced up my nostrils; the call to give as little input as possible to the bike’s movement, merely shift with the driver’s body to stay upright or angle to make turns. Then crunching along gravel, smelling the sulfur-y carbonic acid water when we pulled up to the springs, hearing toddlers in shorts giggle along the paths to the spouters. Saratoga Spa State Park, Saratoga Springs, NY. 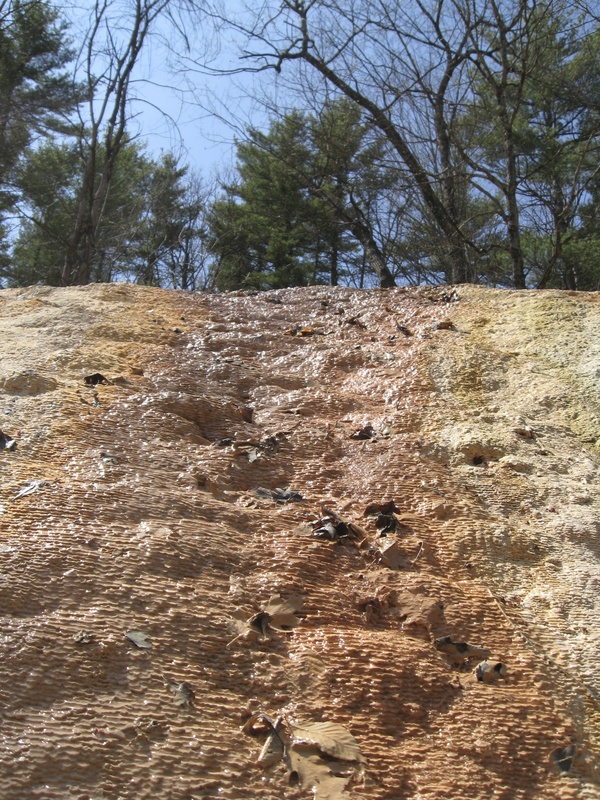 Mineral rich waters bubble out and down the rocks. –An hour’s amble to Jumpin Jack’s hamburger shack on the first hot day of the season, for a cheeseburger topped by coleslaw, finding a long but quick-moving line of post-baseball league families and tattooed Harley Davidson riders, everyone patient but happy-bouncy like little kids because of the warmth. A measured amble afterwards to settle dinner on the way to Stewart’s for dark chocolate ice cream. –Another day: the sun was golden at John Boyd Thacher Park where a bald eagle rode troughs of air over the escarpment, along with turkey vultures, red-tailed hawks, ravens circling–and then three rare Blue Karner butterflies indigo’d the path in front of my hiking companions and I. 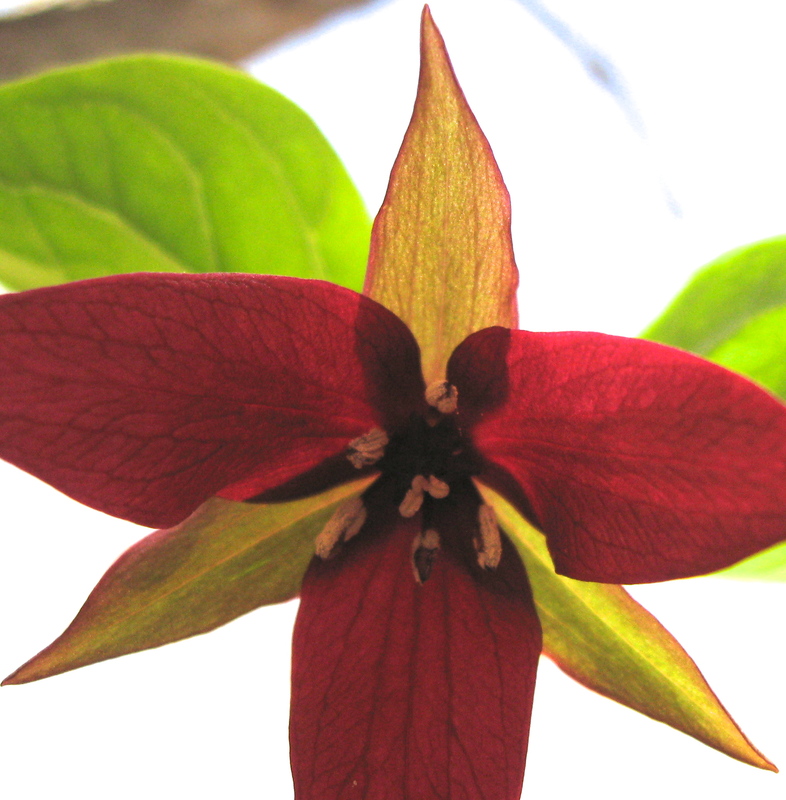 Rare scarlet trillium at Thacher Park, imperfectly framed and yet glowing deliciously from the sun behind. –Talks on the phone caught me up with family and colleagues as I put in window screens to catch the cooler night air, then re-stocked the fridge. Finally I could bring myself to clean out the email queue, a hundred messages at a time (a task not yet complete), unpack the suitcases and put down the new green yoga mat. And to the garden: Planting has begun in the actual garden plot, in addition to my life plan. *** An entire row of three varieties of carrots!, stringless pole beans, lacinato kale, peas, radishes, and this year sweet pansy-faces smile on the row ends, with bachelor button and cosmos seeds strewn in. The little girl and boy who live in the house next to my community garden begged for seeds when they saw the activity; we tossed a packet of zinnias over the fence. Dug and double-dug, compost and mulch added in, planted, marked, rows covered with peat moss, thoroughly watered. Growth, that we can’t see yet, already occurring. These May mornings I rise at 5:30 just like at school, loop mala meditation beads around my wrist to remember my sangha (study community) and chant along with the grainy video I took of my instructors singing the Student-Teacher Mantra. I listen to my own body’s needs on the yoga mat, and study how to teach others, giving myself hours a day to learn. Of course I overextend in studying, and other parts of my returned-to life. Then I remember the Niyama I am practicing of Ishvar-Pranidhana: softening and opening to the play of the universe. I kindly, gently and compassionately, rein myself back in. 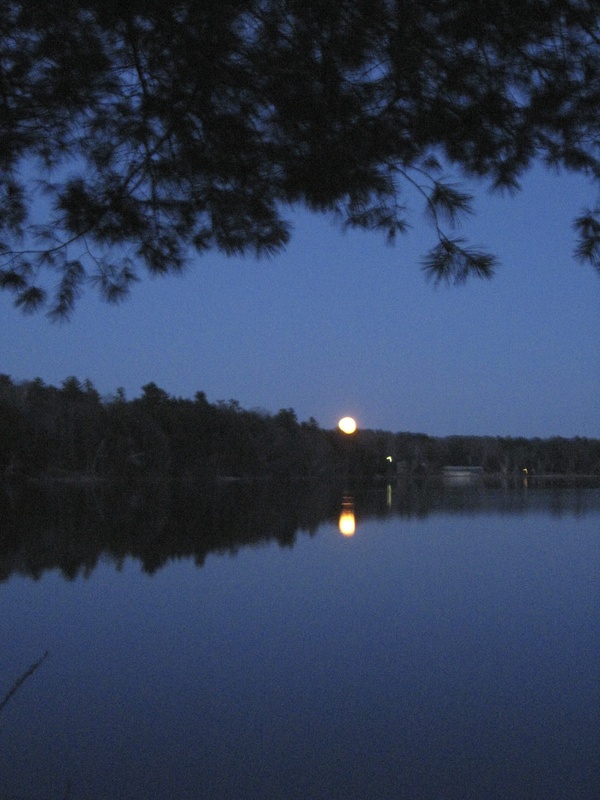 April’s full moon, called The Awakening Moon in some traditions, over the lake at Kripalu. Awakening, indeed.